Usually, I’m always wanting friends, people that I know or even strangers on the street to buy cars - cars that I’d want to be driving. Why? Because if I’m not buying one, then I want other people to buy one so that I can drive them. Why buy cars for yourself when you can get others to do so? Let them handle the costs of ownership while you just get to have fun driving it. But, of course, sometimes this strategy fails. Actually, most of the time it fails - usually 99.9% of the time. No matter how hard I try to utilize various persuasion techniques that I’ve googled, it never works. I’ve found it nearly impossible to change people’s decision of taking the financially prudent route. It is so difficult to convince people to spend $50K on a car, and then lose thousands in insurance, maintenance and depreciation costs - and I just can’t figure out why. But what if I want to drive cars other than the one I own? What other avenues are there? I suppose I could always ask people to drive their own personal cars but that doesn’t always work so well either. Most people treat their special cars like they are the eighth wonder of the world that should only be looked at and admired but never touched. Driving the car? Out of the question! Also, I certainly don’t want to run into the possibility of some accidental damage in which case the conversation would turn uncomfortable very quickly. At this point, I would take off running and hope to never be found again. I suppose there is the dealership test drive option as well. But I’d rather punch myself in the face than go to a dealer and deal with the sales people. I’ve pulled up many times into a dealer and as soon as I see someone walking towards me, I jump back into my car as quickly as possible and drive away. The few times that I do stick around and want to drive something, they always want to come with you. What?! No thanks. But then, there’s another option. An option I hadn’t thought of before. It just so happened that quite serendipitously, I met someone who works at GM’s IT facility here in Austin. GM, was it? Immediately, the scheming began. Does that mean they get to drive GM cars? If so, what kind of cars? So after investigating some, I found out that GM employees can request certain cars like a Cruze, a Malibu or a Camaro - boring. Well, maybe if it was a V8 Camaro I’d be interested, but still, I wanted something of a more exotic GM variety - like a C7 or a CTS-V. Or even a C7 Z06! But it turned out that that the only thing available was a 2015 C7 which was perfectly fine by me. Unfortunately, it wouldn’t be available for many months because as you can imagine, many GM employees had signed up to get a hold of the car. The wait was so long. We waited, and waited, and waited some more. And then finally, it showed up. A $72,850 2015 C7 Corvette with a 7-speed manual. That was a good day. Instantly, he became my best friend even though I had only met him a few months prior. I cherish anybody that can get me a car to drive. Of course, I’m joking. I appreciate people for many of their other qualities - like their connections with great local mechanics who can fix my car for free. I have seen a few C7s around before and ridden in one but this was my first time to drive one. In the past, people may have had good reasons to hate the Corvettes: cheap interiors, questionable materials, crappy handling. But there is not much you can hate about the C7. It looks sleek and the interior is so vastly improved from previous generations that you would never believe you were in a Corvette. The fit and finish on the inside are shockingly good and the digital center gauges look beautiful. And the seats - oh my god - the seats! Whereas the C6 Corvette had folding chairs from Walmart installed in it, the C7 comes with real seats with actual support! They were amazing. What I didn’t like about the C7, though, was the media and touch screen interface. It was too slow, laggy and there was a lack of sensitivity on the touch screen display. It was frustrating. GM, listen up. We are now in an age where we have mastered interfaces - take a look at the latest Android phone or iPhone for instance. These days, there is no excuse for a crappy touch screen interface. Please poach some people from Apple or Google to help you figure this out. 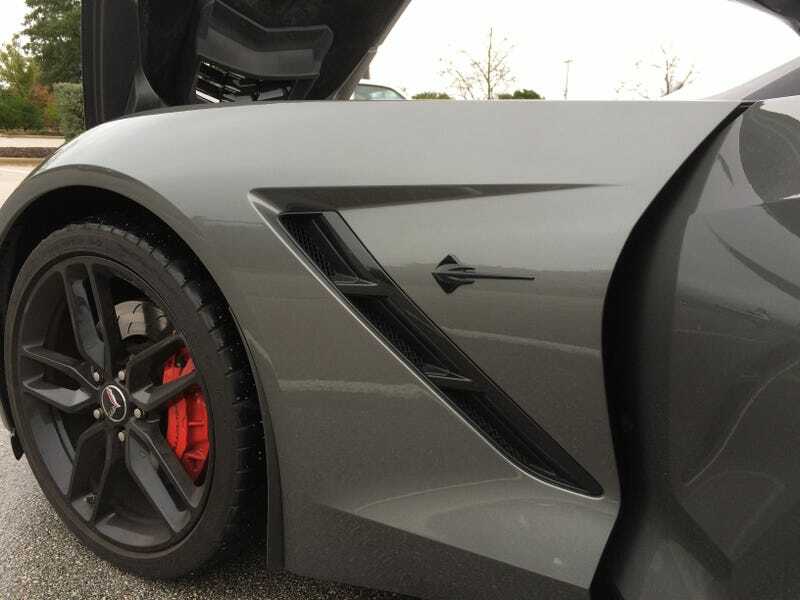 The C7 gives you an impression that it would be a more refined driving experience than older generation Corvettes but surprisingly it wasn’t. It was noisy with the targa roof and there was more shaking and vibration than what you would expect from what was essentially a new car. But part of it could’ve been the fact that the car has been driven to shreds by the many people who had their hands on it and treated it worse than a rental. It wouldn’t surprise me if the C7 was on its last legs at only 14k miles. Just imagine what a disgruntled GM employee might do to a fully insured Corvette that they get to drive for free. Lack of refinement aside, the C7 turned out to be a surprisingly easy car to drive and have fun with. It had a fantastic short shifter with just the right ratios that made it tough to not row through the gears at every possible opportunity. There was so much power to be enjoyed. There were a variety of exhaust modes in the C7 Corvette to choose from but they were all useless except for Sport mode. That’s when the exhaust gets louder, the suspension tightens up and the handling becomes more precise. All other modes in the C7 muted the exhaust too much. Those modes shouldn’t even exist. What’s the point of having “touring” mode in a ‘Vette? Might as well get a nice cushy Lexus for that. Corvettes have such a terrible stigma which may just finally go away with the C7. Most people don’t want to drive or be seen in a Corvette because of what it represents but the C7 is so good. It’s loud, boisterous, handles well and looks great - exterior and interior! I wish I could’ve kept driving the car for longer but unfortunately it had to be returned so that the next employee could beat the crap out of it. I definitely see one of these in my future, but that will have to wait until it’s old and depreciated. For $72K, I’d rather buy a used Ferrari than a new Corvette. Torque Affair is about exploring my fascination with cars; I’m always on the lookout for things that interest me in the car world.